DYNAMIC FORCES® - DREADSTAR DEFINITIVE HARDCOVER COLLECTION! DF responds to consumer demands, and brings Jim Starlin's classic Dreadstar as an unsigned Hardcover edition! Over 20 years in the making and close to 400 pages of story, art and more! This beautiful Hardcover Edition is available exclusively through the comic and specialty market! For the first time ever, the first and complete arc (made up of the first 12 issues) from Starlin's epic saga is collected in one place! The pages in this new edition have been produced by digitally scanning from the original film, and new dust-jacket art created by Starlin exclusively for this Definitive Hardcover Edition! Also featuring the original covers and character art! Dreadstar features the adventures of Vanth Dreadstar and his crew! 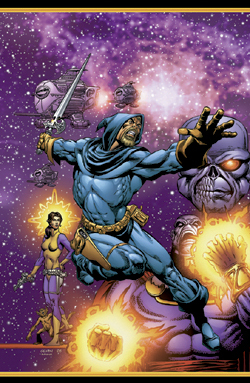 Dreadstar, the last survivor of the destroyed Milky Way Galaxy, found himself transported to the Empirical Galaxy! There, recruited by the sorcerer Syzygy Darklock, Dreadstar helped bring an end to a two-hundred-year-old war between the corrupt Monarchy and the fanatical Instrumentality.